Our product range includes a wide range of marble elephant pair and marble elephant statue. 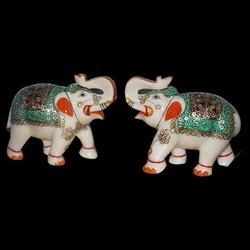 Clients can avail an attractive range of Marble Elephant Pair from us. This range is attentively designed by our team of designers, keeping in mind the varied tastes of our worldwide client base. The range is manufactured using finest quality marble and other raw materials. Clients can avail this exquisite range from us at market leading prices. Our range of Marble Elephant Statue is widely acclaimed among our global clientele for its elegant beauty and exclusivity. This range is designed in finest quality marble by our team of expert craftsmen and designers. 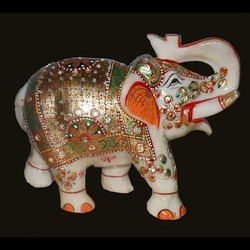 The elephant is delicately decorated with vibrant color patterns. This range depicts the richness of Indian art and is available with us at very nominal prices. Looking for Marble Elephants ?